Yup, it’s that time of year again! We’ll be featuring short interviews with one of LA Zine Fest’s 2014 tablers every day. These posts are always tons of fun, so be sure to keep checking back, or stay posted via our Facebook page or Tumblr! My most recent zine was the 3rd issue of my series I Swallowed The Key To My Heart; it’s a magazine sized comic about breaking up with the boy from Will You Still Love Me If I Wet the Bed? (Top Shelf Productions, 2005). I seriously couldn’t choose one thing: I go through phases of really liking/hating work that I’ve done. At the moment I’ve been really focused on finishing my first narrative graphic novel, a memoir called Tomboy, so I guess that’s my favorite, because of how exciting it is to finally be telling this story. 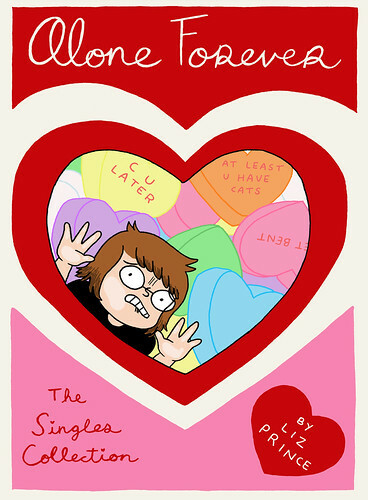 But for corny promotional purposes, y’all should be looking forward to Alone Forever: The Singles Collection, which will be making it’s zine fest debut at LA Zine Fest! Jeff Smith, because Bone was the first self published, black & white comic that I ever saw. Ariel Schrag, because her books Awkward, Definition, and Potential introduced me to the power of straight-forward autobio comics. Jeffrey Brown, because he showed me the ropes as far as being a small press published cartoonist is concerned. I read a lot of comics/zines and non-fiction books, and watch movies/tv, which both “inform” my work. So I would argue that those activities help me artistically. Also, taking a break from whatever I’m writing always helps me come back to it with a fresh outlook, which is why I leave my home office every 15 minutes to check on my cats (you’ll buy that excuse, right?). For more Liz Prince, visit her website at LizPrincePower.com.